It’s a New Dai for Extended Care at TNCS! The New Century School is well known for its convenient before- and aftercare programs as well as its robust extracurricular programming. In October, TNCS welcomed Dehojeni “Dai” Cousins as Aftercare Director to oversee and expand on these popular offerings. Ms. Cousins came to Baltimore 3 years ago but is originally from San Diego, California. She first came to the East Coast to attend college in Atlanta, where she earned a B.A. in Mathematics, although she originally majored in Biology with the intent to become a medical examiner. She soon realized that math was her passion, and, upon graduating, arrived in Baltimore to teach math at Vivian T. Thomas Medical Arts Academy, a medical high school where students get certified to work in the nursing, pharmaceutical, or EMT fields. Despite being so accustomed to working with high school–age children, she adjusted to the younger age groups at TNCS immediately. “Younger kids want you to help them, and they want you to talk to them, so it’s easier to try to get them to do something. They’re easier to engage, and they’re just so loving. High school students tend to have more ‘attitude’ and don’t always want outside input,” she said. Although she came into a program that was already pretty well established, she knows what direction she’d like to take it in from here. Her main focus in the fall was to ensure that students enrolled in before and after care had plenty of opportunities to be creative and active and to basically enjoy being where they are. (Psst—she loves Pinterest!) “I want them to make stuff so they can take home something different. I definitely want to incorporate more activities and a little bit more structure with the students. Some students haven’t learned certain social skills, so I want to help them develop those behaviors,” she said. All in all, for being in a new environment both geographically and professionally, Ms. Cousins is adapting beautifully. San Diego and Baltimore are quite different, for example. “At first it was an adjustment. The weather, the buildings, just everything about it was an adjustment, especially because San Diego is more of a calmer place, and it’s always sunny. It’s a little colder here,” she said. Back in San Diego, she frequented the beach, helped her younger sister with schoolwork—especially math—and did a lot of volunteering at the Boys and Girls Club. Here, she is developing friendships, loves to cook with her boyfriend, and plans to explore East Coast beaches to see how they measure up. Although all of her family is in California, she goes back at least once a year to visit them, and her mother loves to travel and comes here often. Her work, she says, is going very well. She finds it a fun challenge to design new activities for students in Extended Care to pursue. Ms Cousins was adamant about one thing in particular: “Even though I’m young, I’m ready for this task.” You may have noticed—the kids adore her! Meet TNCS’s After Care Director: Aida Abebe! The New Century School works diligently to provide students with a rigorous but well-rounded academic experience . . . and that same diligence is applied to after school programming as well. In fact, you may have noticed a striking difference in extracurricular offerings in the last few years. In its infancy, TNCS relied on after school “clubs” designed and run by the after care staff (see, for example, Spaceship Club Elevates Aftercare at TNCS!). These imaginative and lively pursuits have been supplanted of late with sports, music, arts, and other programs offered both onsite at TNCS and offsite at partner organizations around the city to give older students a wider variety of choices in how they spend their after-school hours as well as to expose them to novel activities such as Parkour and FutureMakers. Most offerings rotate by school quarter to keep the menu of activities fresh, while some perennial favorites such as sports at Coppermine at DuBurns Arena are constants. See the entire lineup of activities that were available to TNCS students this year on the Extracurricular Activities page of the TNCS website. Brand-new this year, students from local schools were invited to attend TNCS’s after school programming and could opt to be picked up from their school by the TNCS van. Sound like a lot to juggle? Enter Aida Abebe, TNCS’s dedicated After Care Director, who assumed this role for the 2016–2017 school year. Ms. Abebe coordinates with partner organizations to establish programs; oversees all of the to-ing and fro-ing of students and activity providers; and, most importantly, ensures that TNCS students are cared for and happily engaged in that crucial time between school letting out and parent/guardian pick-up. Aida Abebe is TNCS’s simply wonderful After Care Director. Ms. Abebe only just took over as After Care Director on November 1, 2016, but she lost no time in making it fully her own. She says that it was a lot to absorb at first, but she enjoyed the challenge and likes the work. She describes a typical day as including interviewing, hiring, and training staff; making schedules and programs for classes; interfacing with other area schools to spread the word about extracurricular activities at TNCS for non-TNCS students; and overall making sure that the programs are running smoothly, that a robust assortment of programs are available to appeal to a wide range of students, and that the programs are both educational and fun. Her arrival at TNCS came after staying home to raise her son, now almost 15 months old. She looks forward to enrolling him at TNCS for the 2017–2018 school year. Originally from Silver Spring, MD, Ms. Abebe attended both Penn State and UMBC and now resides in Nottingham, MD. Her degrees are in Psychology and Sociology, both of which serve her well in her current position. She says she has always loved children and wanted to study specifically how the brain develops. Her previous positions include elementary school counselor and preschool teacher. She enjoys kids of all ages—“the toddlers are just adorable, but I get to do a lot more with the older kids,” she said. Both her parents are from Ethiopia and came to the United States as teenagers; however, they only met in Washington, D.C.—they were not acquainted back home. Thus, Ms. Abebe was fortunate to grow up in a bilingual household, speaking both English and her parents’ native Amharic, a branch of Arabic and Ethiopia’s official language. Each TNCS instructor also lends his or her skills to the lineup. Take, for example, K/1st-grade teacher Kiley Stasch’s cooking class, in which students had a wonderful experience, learned some cooking basics, and expanded their taste horizons. As an end-of-quarter bonus, Ms. Stasch compiled all recipes that the class tackled in this downloadable cookbook: 2016–2017 Cooking Class Recipes. What are the most popular extracurricular activities? Latin dance, run by Professor Manuel, was the runaway favorite so far this year. “The kids also really enjoyed duck-pin bowling at Patterson Lanes and swimming at the MAC,” she reported. Especially exciting, kayaking debuted for Q4. All of these wonderful and diverse offerings come with administrative strings attached, which Ms. Abebe deftly manages. Minimum enrollments must be met to run certain programs; costs must be monitored to keep programs affordable for parents. When something doesn’t work out for one of those or other reasons, she has a back-up course ready to launch. Speaking of launching . . .
Students get a run-down of the rules by TNCS chaperones. And TNCS is happy to have you, Aida Abebe! 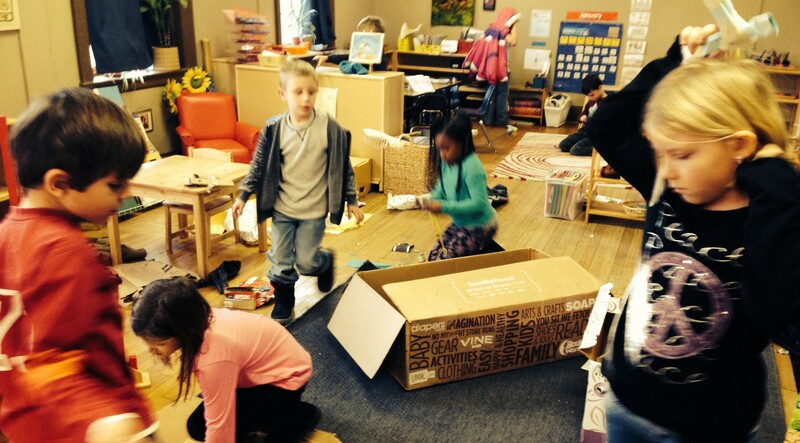 Spaceship Club Elevates Aftercare at TNCS! One of the perhaps unfortunate developments in modern society is that school lets out midafternoon, but the workday continues, making aftercare an essential service for many families. Isn’t it nice to know that at The New Century School, aftercare is just as enriching an experience as the rest of the schoolday? Enter Emily Feinberg, Aftercare Coordinator, who strives to make sure that kids are engaged and happy and using the gap time between school and home in worthwhile ways by creating “clubs” that appeal to individual student predilections. Clubs range from music themed to math, drama, and world culture. Prior to the beginning of the 2013–2014 school year, Ms. Feinberg approached Aftercare Instructor Ron Shalom and asked him to suggest an idea for a club. That was no problem, says Mr. Shalom, who has spent lots of time with TNCS students and has developed a good feel for what appeals to them. He’s not particularly a fan of science fiction himself, but says that kids are forever asking him about all things Outer Space. And so, to give the people what they want, Spaceship Club was, er, launched! Mr. Shalom is just the kind of well-rounded person TNCS likes to have around. The Maryland native joined TNCS staff on moving to Baltimore in March 2013. Prior to that, he studied linguistics and music at Oberlin College and Conservatory. In addition to teaching, Mr. Shalom is a talented composer and songwriter and plays the piano, double bass, and guitar. He also speaks Spanish and Hebrew. (Music, art, languages—a Renaissance Man, indeed!) Naturally, he brings a lot of his innate creativity to aftercare. This spaceship workshop is a hive of activity on Mission Days. So, enough orbiting around the subject—what is Spaceship Club? “The premise behind the club,” says Mr. Shalom, “is that all of the students are aliens from Planet Ickydoo, and they’ve come to Planet Earth to explore.” Basically, Spaceship Club is an imaginative new world where kids create, pretend, and participate in a collective narrative. It’s really quite special. But it’s also one of those amazing organic things that you really have to witness to fully appreciate (see video below). A story underpins the hour-long club, and this story unfolds a new way each and every time the kids meet because they are spinning the narrative as they go. The interactive story-telling aspect alone is quite inspiring to see, but it’s not the only way kids tap into their creativity in Spaceship Club. They also actually build spaceships! The skills they cultivate in the process are limitless—engineering, math, physics . . . even communication technology! Then there’s the astronomy and geography that also come into play. Wait—also anthropology, sociology, and zoology! Before we get too far ahead of ourselves, let’s back up and start at the beginning (no, not the Big Bang, more like 4:00 on a Friday afternoon). Between 11 and 13 kids assemble in the day’s designated space (sometimes The Lingo Leap, sometimes outside, sometimes a classroom), and the space is instantly transformed into Planet Ickydoo, our Spaceship Club participants’ home and headquarters. The Ickydooians immediately commence repairs on or, if necessary, new construction of their spaceships to be ready for the day’s mission to Earth. The purpose of these missions is data collection. Ickydooians observe, take notes, and report back on earthly goings-on, such as climate, inhabitants (animal and human), topography, and vegetation. Endless subnarratives are possible during these missions, and the kids take full advantage! They adopt special names, for example, or discover Dr. Seussian fruits, or (humanely) trap and carry back snakes to headquarters for more intensive testing and observation. This Ickydooian is preparing to attach a separate wing to his ship. Inside, the spaceships are really quite commodious thanks to state-of-the-art design and engineering. These Ickdooians really know the meaning of teamwork! Maybe they can teach it to Earthlings! This is a specialized, but humane way of trapping “snakes” for further study. See? Mr. Shalom helps resurrect a battered spacecraft. This seeming maelstrom will shortly assemble itself into all manner of spacecraft and attendant instruments. “The jetpacks are for cruising at low altitudes,” says Mr. Shalom. Left, Ickydooian expresses extreme happiness. Right, another Ickydooian expresses extreme happiness. Ickydooians have many ways to express their most commonly experienced emotion. Very important preparations precede any mission to Earth. The Snake Company has lots to do beforehand! An antennae-like piece of The Snake Company’s spaceship. With the ever-changing variety of source materials at their disposal, the students have branched out into making other implements that might come in handy on missions. You never know when you might need your suit of armor on Earth, for instance, and there’s no upper limit on the variety of transmitters and scanners that might serve. “When pointed at an unfamiliar object, the scanners can tell you everything you need to know about that object,” says Mr. Shalom. One key piece of equipment is the ansible, a sort of transponder “[they] made out of an old internet modem and a busted RCA cable,” says Mr. Shalom. Any Ursula K.Le Guin fans will know just what this “superluminal communication” device is. Outfitted with his special gear, this Ickydooian is ready for exploration! This instrument appears to have many uses. Part of a full suit of armor, this shield offers protection to an Ickydooian named Titan. This obliging one-eyed Ickydooian displays her special transmitter. About midway through the hour, the activity ramps up. Mr. Shalom announces the Liftoff schedule and keeps Ickydooians informed with a countdown so they’ll be sure to be “spaceworthy” in time. Liftoff is the high point of the club. Kids scramble into their boxes–oops, ships—and really get into the pretend play. Sounds, sights, and dialogue all enhance the performance as the Ickydooians hurtle toward Earth. Mr. Shalom talks them through each phase of breeching another planet’s successive “-spheres,” lending a little drama to the scene, and then reestablishes a line of communication with each Ickydoo Spacepod. Having landed safely on Earth, this gung-ho explorer wastes no time getting to it! The universe is home to many wondrous and unique beings. On landing, the little space travelers engage in the aforementioned scientific study of the strange, new planet and are continuously reminded by Mr. Shalom to remember to gather plenty of “space algae” for the necessary fuel to return to Ickydoo. All the while, they are garnering insight into other worlds, cultures, and beings and how to live in peace and harmony among them in our shared universe. And so we can add philanthropy to the growing list of important attributes that Spaceship Club cultivates. Working parents, rest easy. Aftercare kids are having an out-of this-world learning experience!